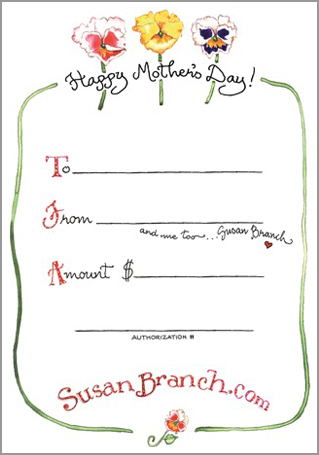 This special Mother's Day Susan Branch Gift Certificate will be the perfect gift! (Gift Certificates can take up to 72 hours for activation. You will receive an email to let you know when it has been activated.) Please choose a Delivery Option. If you choose "Standard Electronic Delivery Only" you will receive a simple email containing your Gift Certificate information. If you choose "Also Mail A Paper Certificate" you will receive an email, AND a cute Gift Certificate, like the one shown in the picture, will be mailed.